ATP Electronics, the leading manufacturer of “Industrial Only” memory and storage solutions, has announced its commitment to provide its own high-density DDR3 8 Gbit components to ensure the steady supply of DDR3 memory, especially for customers in the networking and embedded industries that are yet unable to upgrade to latest-generation platforms immediately. ATP’s own-built DDR3 modules consist of meticulously characterized and tested high-quality integrated circuits (ICs). The components are manufactured according to ATP’s exacting standards using 2x nm manufacturing process technology and are tested via an extensive component test program to improve the overall memory module performance. ATP DDR3 8 Gbit components are free from row hammer effects, thus preventing any disastrous random bit flips caused by the electrical charge of cells leaking to adjacent cells and successively writing data to them. At module level, ATP implements 100% test during burn-in (TDBI) into the production flow to guarantee the high-quality module. ATP DDR3 components are available in monolithic 8 Gb one-chip select (1CS) or as DDP two-chip select (2CS) for a variety of memory modules based on this technology. DIMMs, SO-DIMMs and Mini-DIMMs in 1CS package are available in 16 GB capacity and 1600 MT/s transfer speed. ATP offers 2CS DIMMs in 16 to 32 GB capacity and 1333 or 1600 MT/s, while 2CS Mini-DIMMs are at 8 GB capacity and 1600 MT/s. ECC and non-ECC options are available on various form factors. ATP is fully committed to supporting the legacy memory requirements of customers that are yet unable to upgrade to newer-generation platforms. In September 2018, ATP signed a partnership agreement with Micron Technology, Inc. to make sure that Micron DDR2 SO-DIMMs, UDIMMs and RDIMMs will continue to be available after Micron announced end-of-life (EOL) notices for these modules. According to the agreement, ATP will manufacture DDR2 DRAM modules for customers that continue to use platforms supporting these memory types. ATP is also authorized to manufacture SDR/DDR DRAM modules for Micron customers unable to migrate, as well as selected legacy DRAM modules specifically for customers using AMD Embedded/Geode platforms. 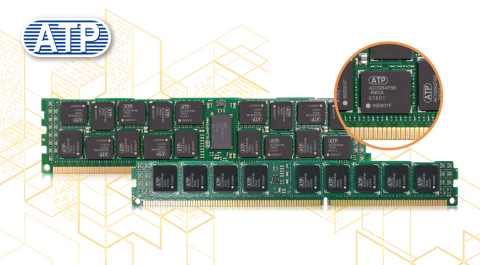 With ATP providing 8 Gbit components for DDR3 memory modules, the company reaffirms its commitment to continue supporting legacy memory requirements to maximize customers’ return on infrastructure investments. ATP Electronics is the leading provider of “Industrial Only “high-performance, high-quality and high-endurance NAND flash products and DRAM modules. With over 25 years of manufacturing expertise, ATP ensures that all its products are designed and built to accomplish mission-critical tasks in industrial/automation, telecom, medical, automotive, and enterprise computing applications where high levels of technical proficiency, manufacturing quality, and wide operating temperature ranges are required. ATP is a certified Eco/Green partner of tier one OEMs and all ATP products are fully RoHS and China RoHS compliant. A true manufacturer, ATP manages every stage of the manufacturing process to ensure quality and product longevity, offering in-house design, testing, and tuning from component to product level. ATP supply chain support includes controlled/fixed BOMs and long-term product life cycles. For more information on ATP Electronics, please visit www.atpinc.com or contact us at Info@atpinc.com.